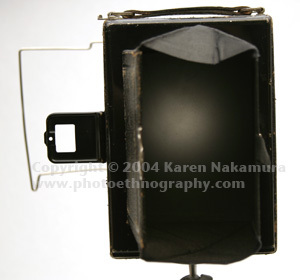 This folding plate-film large format camera is a bit of a mystery. I bought it from an estate in February of 2004. The film holder says Voigtländer, but the camera body itself only says "Zeca" and "Made in Germany" but no company name. Using the text or images on this website without permission on an ebay auction or any other site is a violation of federal law. 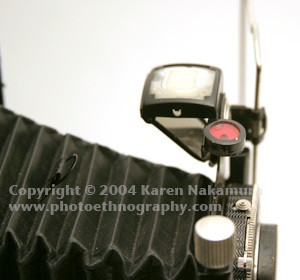 I first assumed the camera was made by Voigtländer because the film holder was made by them. I also couldn't read the stylized name - my attempts to look up "FECA" and "LECA" cameras yielded nothing. Thankfully, the people on the Cosina-Voigtlander User Group mailing list told me that this is actually a "ZECA" camera. Douglas Sharp informed me that Zecas were made by Paul Zeh Kamerawerk, Dresden, Germany. 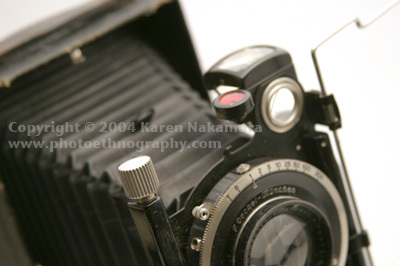 And that he knew of "a very interesting folding TLR (Zecaflex) 1938 6x6 camera with Xenar or Tessar lenses." The camera supports about fifteen millimeters of lens rise and fall (shift). There's no tilt capability. The camera takes plate film. I haven't figured out yet how to adapt it to use sheet film. There's only one film holder so it's a bit difficult to play with it. But that's what long weekends are for, right? The uncoated Rodenstock Ysar lens is highly rated on other camera bodies, so the results should be interesting. There is a "Feca" logo on it. Lens reads; F. Deckel-Muchen, Compur, Doppel Anastigmat Euryner 1:4.5 f=10.5 cm No. 452706 Rodenstock Munchen. Shutter works and speeds are proportional, however I have no way of accurately measuring the speeds. Aperture works. Bellows is in good shape, no light leaks. I'm asking JadeGarden permission to post the pictures from the auction here. The Zeca was manufactured by the company you have listed. The plant was destroyed during the relentless bombing of Dresden, Germany near the close of WWII. This was when the allies targeted civilian targets. There are numerous histories on the subject scattered about the web. 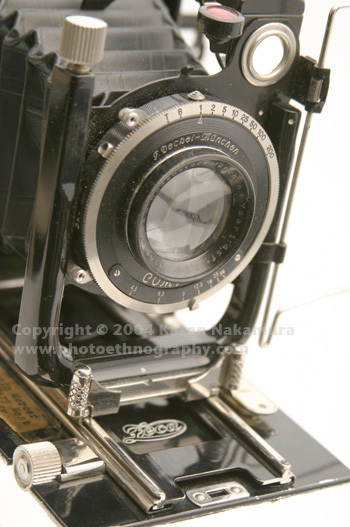 I had the exact same camera with a Rodenstock 135mm lens in the Compur shutter. I had also collected around 20+ film holders for it. 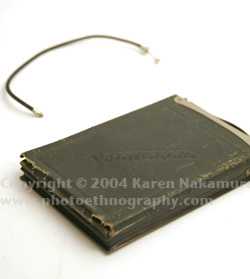 The film holders have mostly been switched from glass plates to film sheaths over the years. The film holders should be about 1/4 of an inch thick front to back. The sheaths will hold a 9x12cm sheet of film. You want to be sure to avoid the film pack adapters for these (and any other cameras as well), as the pack film hasn't been available since the early 1980's. This was the holder that my Zeca had come with. (I did manage to take a photograph with the pack film adapter by filling it with cardboard cut to size, painted flat black, with a piece of 120 film cut to fit and centered on top of that cardboard. I've got some photos from the Zeca on my website. The 135 Rodenstock is a fantastic lens. When I put my Zeca and film holders up for sale (on photo.net) the holders were snapped up by the first contact. It took me awhile to sell the Zeca. Finally I swapped out the Compur with the Rodenstock with a non-functional Dial Set Compur with a Skopar lens and dropped the price down to around $10 to move it. 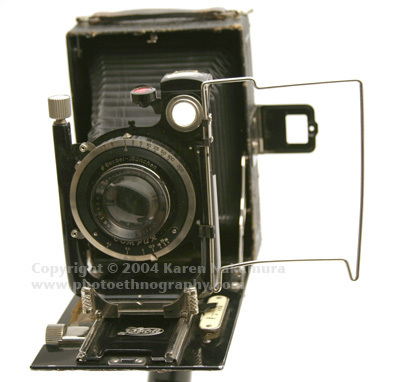 I put the Compur with Rodenstock on a lens board and use it with all of my 4x5 cameras. While everyone raves at how great the Ektars are, they don't come close to this Rodenstock. Folded: 4.5" x 6.25" x 2"
Copyright © 2006 Karen Nakamura / Photoethnography.com. Use of this chart, text, or any photographs in an eBay auction without permission will result in an immediate intellectual property violation claim with eBay VeRO. Violators may have their eBay account cancelled. Last modified: Thursday, 11-Mar-2010 01:12:24 EST , [an error occurred while processing this directive] .